It’s no secret that Cricut users are some of the best people on the planet. That’s why it’s been such a joy for us to turn the spotlight on some of our talented DIYers who’ve utilized their machines for a variety of good causes. Today, meet Special Education teacher Nancy Ross from Felix A. Williams Elementary in Stuart, Florida. She saw how well her students responded to “Make It Now” designs in Cricut Design Space and decided to involve them in the process. Their enthusiasm and resulting projects have gotten an A+ from the school, community and, most importantly, the kids themselves! Nancy Ross in her own words…. I teach Special Education to fourth and fifth graders, and their disabilities range from behavioral to academic. Most of them receive speech/language counseling and occupational therapy. This year, I got the idea of using the Cricut in the classroom in order to make incentives for positive behavior. I found sayings on “Make It Now” that I thought they would like and put them on clipboards around the room. They asked if they could personalize them, so I brought my Cricut into school and they began to learn how to use it. They had to measure items, fonts and images for placement and had to spell and use uppercase letters correctly. They began to ask if they could make items for friends and other teachers. When I replied that it all costs money, they came up with the idea of selling their handcrafted products. With permission from the principal, we came up with a business plan, putting the “profit” towards their end-of-the-year field trip. (Most of my students could not otherwise afford this.) They took orders for customized items, and I bought the vinyl and brought in my Cricut on Fridays so they could craft. Tumbler and car decals were big hits. And, the students’ behavior has never been better. They love working on Fridays! My advice for teachers is show your principal all the standards (math, technology and language arts, just to name a few) that you can incorporate in your lesson plans to justify using the Cricut. It built my students’ self-esteem and taught them social skills, like maintaining eye contact, handshakes for deals and money management. It also helped them think of others by making cards for shut-ins around the holidays and gifts for family members. The “Make It Now” projects have easy-to-follow instructions that help the students quickly comprehend the new technology. 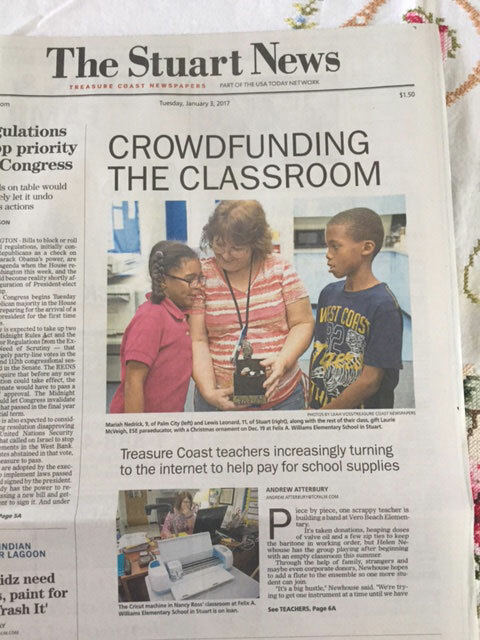 See below for an article the local newspaper did on Nancy’s incredible group of students and their Cricut project! You can also read more about her efforts here. I have owned my Cricut for almost a year. I LOVE it! Family, friends and colleagues all think I’m a bit obsessed. Whenever they need something, they all say, “I bet Nancy can make that with her Cricut.” So far, that has included a clinic bulletin board, team t-shirts for parties and Literacy Week items. I create things using my iPad, iPhone and laptop, at home, school and while waiting almost anywhere. Facebook groups and the Cricut YouTube channel are my inspirations. They offer so many suggestions and make it so easy to do. I am a crafty person, but for so long I didn’t make anything. This awakened my spirit to start again, and I am hooked! Nancy, your enthusiasm and passion for encouraging your students have done us a world of good. We look forward to seeing what these young DIYers create in the future! What an awesome thing to do! I am so impressed by the students and that they came up with the idea to make money to help with the expenses. These are skills that will help them their whole lives. This is such a wonderful idea and a great experience for the children while they’re learning and using what they learn to create and to be proud of themselves and their teacher! This is a really awesome story! Thank you for sharing it! Such great ideas! I think we need to change the curriculum to suit what students will use them for in the real world. I work in a school and feel it’s not about paper and pencil work anymore . Wouldn’t it be wonderful if Cricut would generously support the enthusiasm of and educational benefits to these students with a donation of supplies?!! I teach with Nancy and we are so proud of you! The innovating ideas you have incorporated into your classroom this year have clearly made a positive impact on your students and our school community! Keep up the good work!